The Japanese Navy's midget submarine attack in Sydney Harbor on the night of May 31 and June 1, 1942, shocked the Australian people, who up to that time had thought that the country's remoteness provided some degree of security from the Japanese aggressors. Toku-tai focuses on this surprise attack and also covers the more successful conventional submarine attacks on merchant vessels off the east coast of Australia that sank 18 ships and damaged 15 others in 1942 and 1943. This book published in 1992 corrects some of the errors in the official government account of the Japanese midget submarine attack prepared by Rear Admiral Muirhead-Gould. However, two later books by other authors (A Very Rude Awakening (2007) by Peter Grose and Japanese Submarine Raiders 1942: A Maritime Mystery (2006) by Steven Carruthers) provide more thorough research and more focused presentations about the attack. 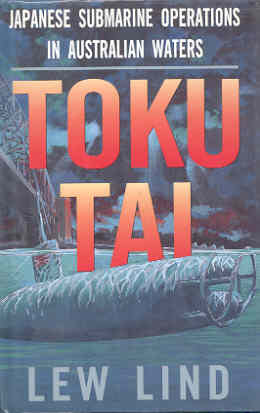 The book title of Toku-tai apparently comes from a misspelling of the Japanese word tokkotai, a shortened form of tokubetsu kogekitai, which means Special Attack Corps in English. Lind explains that toku-tai comes from the phrase of tokubetsu kagekitai (p. 10), which is incorrectly spelled, and then he also uses the wrong shortened form of toku-tai rather than the term tokkotai that has been widely used in Japan since its introduction in 1941. The term tokubetsu kogekitai (or tokkotai for short) was used by the Japanese to refer to midget submarine units, starting with the attack of five midget submarines at Pearl Harbor on December 7, 1941 . Special Attack Corps (tokkotai) refers to a group that makes attacks from which the men did not expect to return, and the Japanese Navy used the same term for kamikaze, kaiten (human torpedo), and shinyo (explosive motorboat) units that carried out suicide attacks near the end of World War II. Lew Lind, author of Toku-tai, served from 1964 to 1987 as Public Relations Officer at Garden Island Naval Base. One of his responsibilities was verification of articles found in and around Sydney Harbor that might be related to the Japanese midget submarine that had not been found at the time of this book's publication, but none of the various articles recovered by divers related to the missing midget. Finally in 2006, 64 years after being lost at sea, the missing midget submarine was found by seven amateur scuba divers on the seabed about 5 km from Sydney's Northern Beaches. The two other Japanese midget submarines were recovered soon after the attack, and the Australian Navy held a formal funeral for the four crewmen recovered from these two midgets. 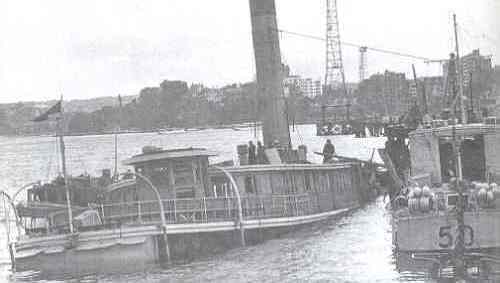 During the attack only one midget released its two torpedoes, and one of them hit the accommodation ship HMAS Kuttabul, used as a tourist ferry prior to the war, and killed 21 men. The 16 pages of photographs in the center of the book include six Japanese crewmen of the three midget submarines that attacked Sydney Harbor, several of the Allied ships that took part in the battle, midget submarines, and the recovery of two midgets soon after the attack. Some parts of the book have little to do with the attack on Sydney Harbor or the subsequent Japanese submarine attacks on merchant ships off the eastern coast of Australia. For example, an entire chapter covers the British midget submarine attack in September 1943 on the German battleship Tirpitz in Norway, which was included by the author based on its supposed similarities to the attack in Sydney Harbor over a year before. History has marked Lieutenant Matsuo as the least decisive of the three midget submarine commanders. By remaining outside the harbour boom for eight hours, he reduced the chances of success in a coordinated surprise attack. His failure to follow and support his fellow commanders in the early stages of the raid contributed to his own failure and the failure of the attack. In sharp contrast, Grose (2007) and Carruthers (2006) make no such disparagement of Matsuo's actions. Gross (2007, 102) explains that the ocean's swell caused all of the three midget submarines to arrive very late at the harbor entrance, and the midget submarines each launched from a different mother submarine did not have any way to contact each other during the attack. Gross (2007, 157) describes Matsuo's "sitting patiently one the ocean bottom near the Sydney Harbour heads" rather than making a negative judgment on his decisiveness. 1. Sakamaki 1949, 16; Tokkotai Senbotsusha 1990, 1, 12; Ushijima 1999, 24, 85. Carruthers, Steven L. 2006. Japanese Submarine Raiders 1942: A Maritime Mystery. Narrabeen, NSW: Casper Publications. Sakamaki, Kazuo. 1949. Horyo daiichi gou (POW No. 1). Tokyo: Shinchosha. Ushijima, Hidehiko. 1999. Kyuu gunshin wa katarazu: Shinjuwan tokkou no kyojitsu (Nine war gods story not told: Fact and fiction of Pearl Harbor special attack). Tokyo: Kojinsha. on 1 June 1942. Two hours later only the funnel was visible.